Jewschool is proud to be a media partner for the first ever Jews of Color National Convening on May 1-3 in NYC and to host this series written by Jews of color about their movement for greater racial justice within and by the American Jewish community. These articles represent their authors and may not reflect the views of sponsoring organizations. Read the full series here. Chava Shervington, President of the Jewish Multiracial Network, and I talked in depth about how we would balance protecting the Jews of Color who’d trusted the Convening to be a safe space with the importance of getting out the Convening’s message. How could we let media in without having full access to what they did and did not report? How could we let them see the Convening from our point of view? As we’ve unfortunately learned the hard way in the past, the answer is that we can’t control what the media sees or what they chose to present. It is my opinion that the best pieces of news — blogs, articles, books, written about Jews of Color have been written by Jews of Color; that only we know how we feel and no reporter can fully understand what it is to be a Jew who doesn’t “look” Jewish. Even when we share our truths through poetry, blogs, books, articles, interviews, and commentary, there are Jews more than willing to piece them into morsels in a way that makes our experiences more palatable, rather than validating our truths. So how does a “white” Jew report about Jews of Color in a way that doesn’t undercut who we are? In no particular order I’ve come up with the top 10 ways to report or write about Jews of Color. If you’re a Jew and you’re writing about Jews of Color then you’re writing about Jews. There’s is nothing more annoying, or plainly more insulting than reading a piece of media about Jews of Color peppered with “they” statements. It further separates Jews of Color from the mainstream Jewish population and it perpetuates the assumption that Jews of Color are somehow different or separate from white Jews. Or worse, not “really” Jewish. Maybe it’s your first time writing about Jews of Color. Maybe you’ve been enraptured by the story of Ethiopian Jews who were airlifted to Israel in the 90s. Maybe you’ve been studying the Jewish communities of India. And that’s all well and good, but Jews of Color aren’t exotic specimens for examination, we’re people. Just like you. These are just a sample of statements that Jews of Color are used to hearing. And it’s unfortunate that we know that we’ll always hear them. Writing a piece about Jews of Color from the perspective that all Jews of Color have converted, or assuming that there is some “reason” that we are Jewish discounts the many Jews of Color who are Jews because we were born Jews. If you wouldn’t open an interview with a white Jew with the question; “Tell me about your journey to Judaism,” then don’t ask that of a Jew of Color. In the United States White Ashkenazi normativity is pervasive in Jewish culture. I say this with the realization that many Jews of Color, myself included, are Ashkenazi Jews. And while this is true, many of us bring to our Judaism our black American roots through food, music, and traditions. We bring our Latin roots, our Asian roots, our Indian roots … you get the point. Sometimes these roots aren’t seen as “Jewish” simply because they are not what is the norm in European Ashkenazi Jewish Culture. And that’s okay. If you’re not reporting about Jews in Ethiopia (or China, or India or Uganda, etc.) There’s no need to talk about those communities in relation to all Jews of Color. This speaks a bit to point #3. There are so many Jews of Color across the globe and in the farthest reaches of the world. In fact, it has been suggested that you can find Jews on every continent except Antarctica. To place Jews of Color vis-a-vis Jews of (Blank) assumes there’s a “reason” behind someone who is, say, Black and Jewish. Geographically speaking, Ashkenazi Jews have European roots and Sephardic Jews have Spanish roots. Many Jews of Color have either Ashkenazi or Sephardi minhag because of marriage or birth. Often it is the norm for rabbis and others to presume that their audiences share a European background, such as saying “Our ancestors who came from Poland…” These are problematic because the assumption that Ashkenazi means white erases the various cultural narratives of Jews of Color. This is typically a more difficult task than it would seem. Even more difficult is tohear. To hear when Jews of Color say that we feel discriminated within the Jewish Community. To hear that the Jewish community can be racist. To hear that rabbis aren’t ready to truly work on making synagogues inclusive. But those are our truths. Several news outlets have reported on fringe groups like Hebrew Israelites or Commandment Keepers touting leadership in these organizations as leaders for all Black Jews when a simple Google search would give some clear answers. If you wouldn’t call a Messianic Jewish leader the Chief Rabbi of Ashkenazi Jews in the U.S, why report that a leader of a religious group that’s not Jewish is the leader of all Black Jews? When it comes to Jews who are Black and Jewish reading articles like this is not only maddening because it’s not true, it gives Jews who don’t think there aren’t issues with racism or lack of diversity an out. I cannot tell you how many times I’ve received emails, Facebook comments, or Tweets telling me that there is a Black Synagogue in Harlem that I should go to if I want to be around “my kind”. “Jew of Color” is a sometimes complicated title for a myriad of people of color who identify as Jews. 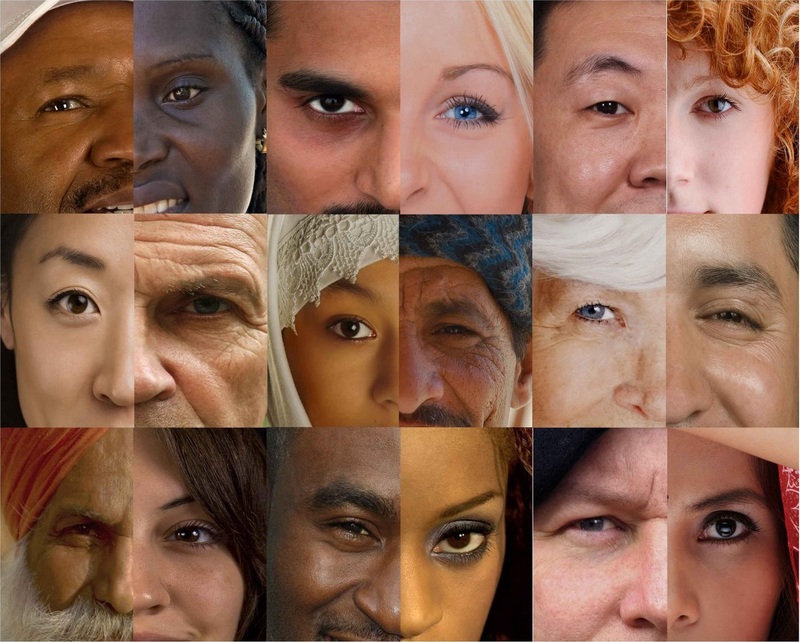 Jews of Color are a wide and varied people that reflect a range of races, ethnicities, and nationalities, family backgrounds, sexual and gender identities, religious practice, political beliefs, and a diversity of other characteristics that make us all uniquely human. It’s impossible to make the statement, “Jews of Color are (blank)” because it’s impossible to lump every Jew of Color together. We like to say, “Welcome the stranger in your midst” in this season. Too often Jews of Color who hold a rightful place at the table are seen as outsiders. We can do much better. I am glad to be going into this Convening surrounded by over 100 Jews of Color. I’m excited to be in a Jewish space where I am not the minority, where Jews from varying shades of beige, brown, and black will be able to speak our truths and hear with our hearts. I’m excited for the simple solace of not having who I am questioned. So if you’re coming to report on this magical space in time, respect it. Know that you will be standing, like Moses did at the burning bush, on holy ground. In Which Sexism Remains Mysteriously Present. I am not a journalist. I am a professional in the Jewish community and have a multiracial Jewish family. While I agree that “Tell me about your journey to Judaism,” is offensive in that it implies a conversion, I regularly have conversations with Jews of all kinds that begin, “What’s your story?” or more likely, “What’s your Jewish story?” It is a fabulous way to connect with a fellow Jew around shared values and shared peoplehood, something at the heart of what is important to all of us. When you are a Jew of Color (as opposed to someone who knows or even loves a Jew of Color) the question “Tell me bout your journey,” “What’s your story?” etc. have a different resonance, and they come with alarming frequency to these Jews. The fact is that at least some of the time, if not most of the time, the question comes either from a conscious skepticism or an unconscious discomfort with ambiguity, with not understanding, and requiring that ambiguity explained, requiring one’s curiosity fulfilled. If you think you’re about to ask a Jew of Color one of these questions, stop and ask yourself why. And then, regardless of your answer, just STOP. Do not ask the question. Because WAY more important than your intent is the IMPACT of that question on the one being questioned. And the truth is that these questions come so frequently to Jews of Color, that they carry an unnecessarily enormous “narrative burden”—they are way too often asked to explain themselves. So whatever you may think that the intent of your question is, don’t ask it. Your additional query is yet another microagression that you are inflicting on your fellow Jew. Imagine that you are a Jew of Eastern European heritage, with some identifiable Eastern European Jewish features, and it is the 40s and you’re working in Greenwich, CT, and every where you turn, someone “politely” asks you where your family is from or what kind of name is that. Then… welll.. yeah. Just don’t ask similar questions of others. Thanks. Thanks for your comment Joshua! I would have to push back and say that while that may be an okay way to connect, asking someone, especially a Jew of Color, about their Jewish story is the same as asking about someone’s journey to Judaism. I find that no one actuallyasks this from a place of genuine interest about the person and who they are, but out of curiosity and a desire to figure us out.